I was just browsing through, to see what can I make completely different and new. I got inspired by my friend’s recent post in Roshni’s Kitchen. I thought it was interesting to make something that I have had only from bakeries in India. It was there at the back of my mind to make this stuffed bread. But I didn’t have the right stuffing for it that day. 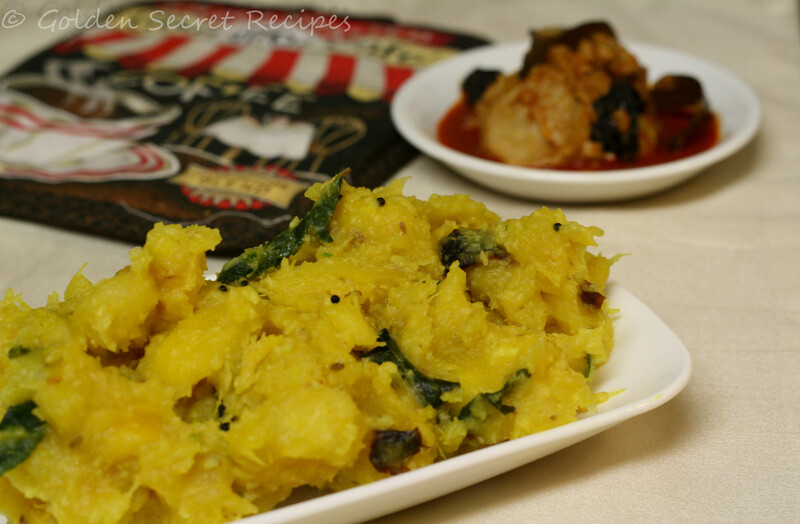 Then one day when I made Achari Chicken, I got reminded of this recipe. I thought it would be perfect for a stuffing. That evening, being a weekend, our friends had visited us. While the guys were busy watching TV, me and my friend, were all set to do the experiment. It came out well. 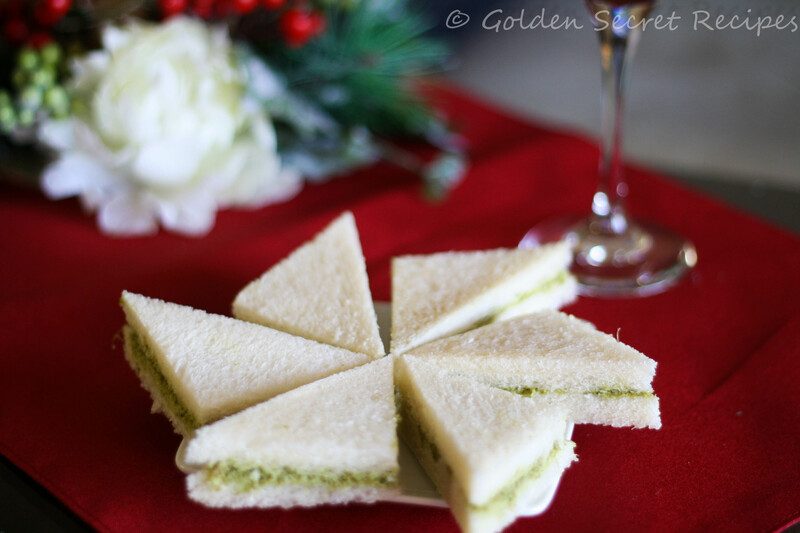 All of us really enjoyed having a snack that was super delicious and looked even more beautiful :-). Well, for the bread, I took the recipe from Hilda’s Kitchen! I have made some adjustments to the measurement as per what we used at home. You could use any stuffing of your choice. I had made achari chicken and it went really well with the bread. If you have any left over gravy, ensure that you heat it in a pan and make it dry. I used 2 cups of Achari chicken, mostly the chicken pieces. Made it into a dry dish and roughly mashed the chicken pieces. 1. In warm milk, dissolve sugar and yeast. Keep covered and undisturbed for about 15 mins till the yeast rises well. 2. Meanwhile, mix all-purpose flour, baking powder and salt in a bowl. To this add yogurt and butter. Mix well. 3. Once yeast rises, pour it into the flour mixture and knead. I used food processor for kneading. You can knead using hands till the dough binds together and feels soft. 4. Grease the dough with 2 tsp oil and transfer to a lightly greased bowl and keep covered in a warm place for the dough to rise. 5. After an hour, the dough would rise to double its size. Gently knead it and divide into 2 portions. 6. 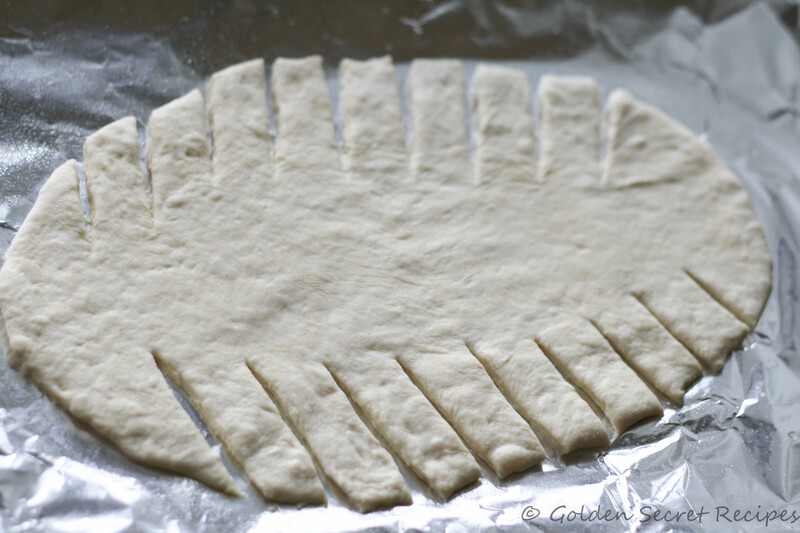 On a floured surface, roll out the dough into oval shape using a rolling pin. Transfer the rolled out dough to greased baking sheet/tray. 8. 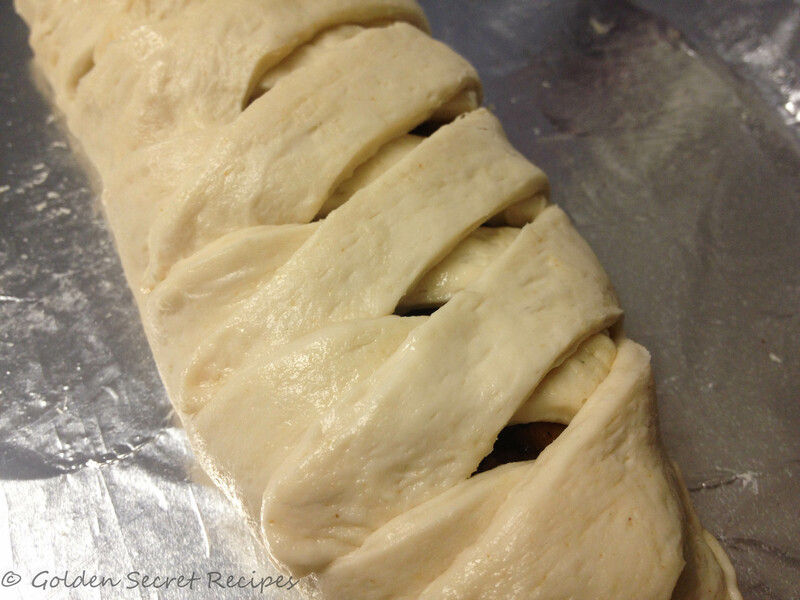 Spoon the filling of your choice to the center of the dough and start braiding. For braiding, start from one end. Take one strip and take it over the filling, across to the other side. Do this alternatively from either side. (Photo attached for better understanding). 9. 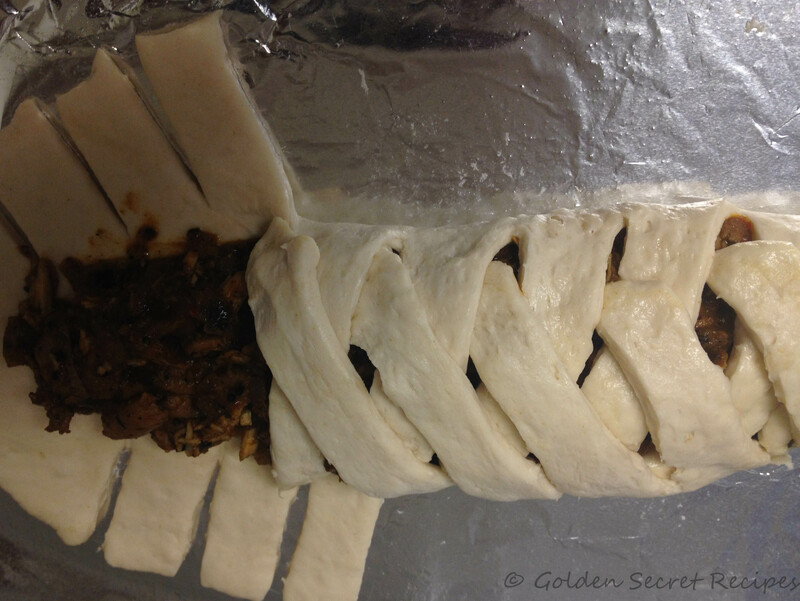 Braid the entire dough such that the filling is completely covered and close the ends properly by either sticking the dough to the corner or cut out the remaining part of the dough to give it a proper finished look. 10. Place your stuffed dough in a warm place and let it stay for another 30 mins so that it rises again. 11. Preheat the oven to 320 deg F. Meanwhile, prepare the egg-wash.
12. Beat the egg properly and brush the loaves/stuffed bread with the egg. 13. 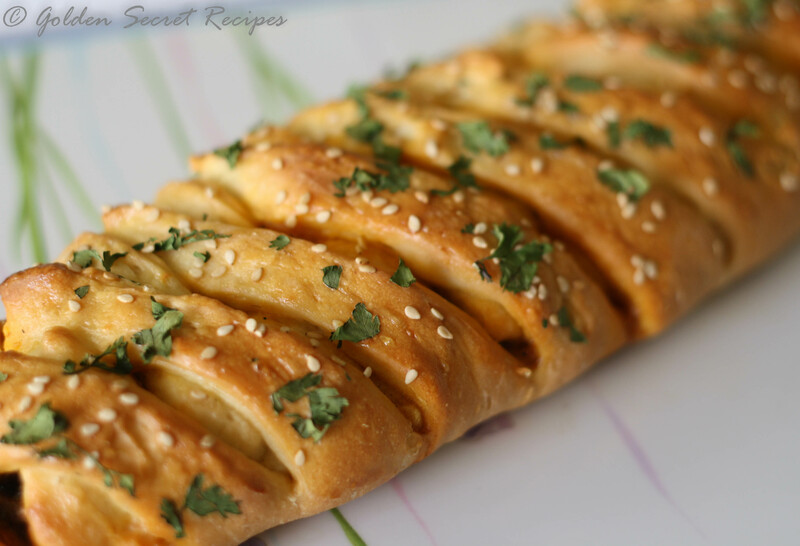 Sprinkle sesame seeds and chopped coriander leaves on the loaves/stuffed bread. 14. Once the oven is heated to the desired temperature, bake the loaves for 20-25 mins. It should have a golden brown color once done. 15. Let it cool for 5-10 mins before serving. 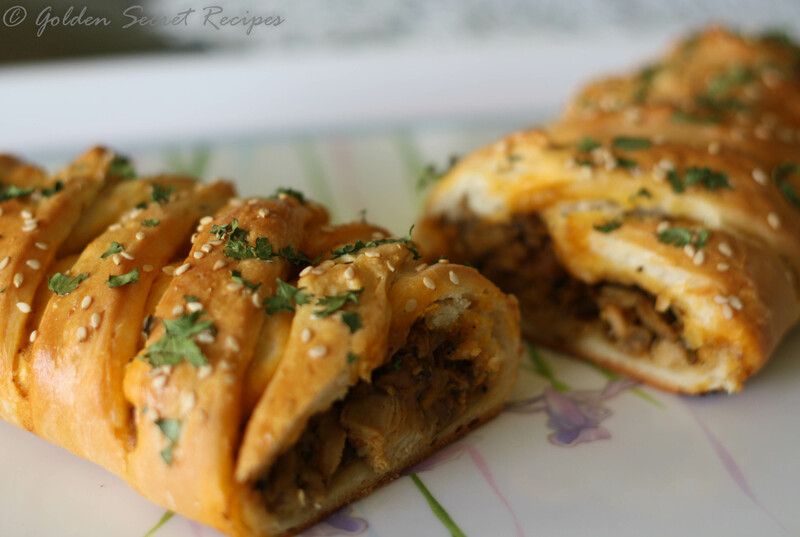 Enjoy the evening with freshly baked stuffed braided bread and a cup of tea/coffee. All the below ingredients can be bought from stores(I used home-made coriander chutney). Also, use the measurements as per your taste. 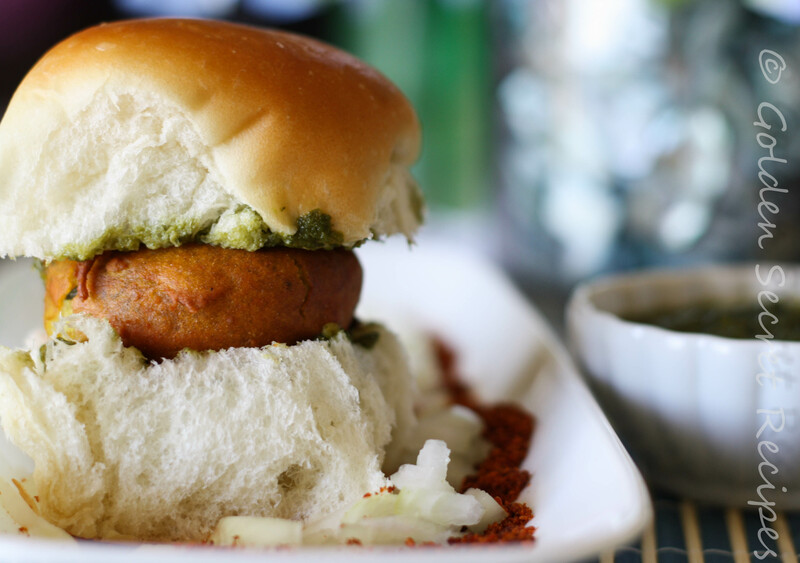 I like more of coriander and dry garlic chutney in my vada pav. Those who like more sweet and sour taste, can use more of tamarind-date chutney. 1. Boil potato in a cooker/microwave and remove the peel. Mash the potato gently(Don’t make it into a smooth paste, but gently mash it to form small chunks). 2. Heat oil in a pan. Add mustard seeds and when it crackles, put cumin seeds. When the cumin seeds also splutter/get brown, add asafetida, chopped curry leaves, chopped green chilli and grated ginger. 3. Saute till ginger becomes light brown. To this add turmeric powder. Saute for few seconds and then the mashed potato. 4. Mix well so that the seasoning is spread evenly over potato. Sprinkle salt and red chilli powder to the potato and mix well. Cook for another minute or 2. 5. Remove from heat and garnish with lime juice and chopped coriander leaves. (You could get the batter ready while you wait for the mixture to cool down). 6. Once the potato mix cools down a little, make lemon sized balls with it. 7. In a deep kadai/sauce pan, heat oil for deep frying the vadas. 8. For the batter, in a bowl, mix all the ingredients listed under ‘For the batter’ section. (I had not used baking soda and it still came out well). To avoid lumps in the batter, mix it thoroughly till it becomes a smooth paste. The easiest way is to whisk the batter. The batter shouldn’t be too runny. It should be of thick consistency. 9. Dip a potato ball into the batter and coat it well with the batter. 10. Slowly drop the dipped ball into the hot oil and fry it. Fry in medium high heat. When the vada becomes light brown, you know that your vada is ready. Gently remove the vada from oil and put on a kitchen towel/cheesecloth to drain excess oil. Repeat this for the remaining balls(You can fry upto 3 vadas together). 1. Slice the pav/bread into halves. 2. 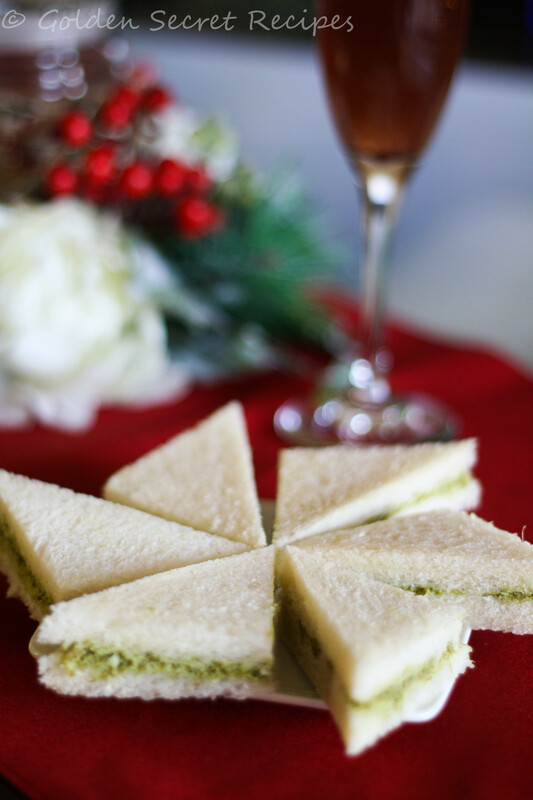 Spread your preferred quantity of coriander chutney on inner side of either halves of the pav. 3. Pour the required quantity of tamarind-date chutney also on either halves. 4. On the bottom half, put the dry garlic chutney and chopped onion. 5. Place the vada on the bottom half and place the other half of the pav on top. 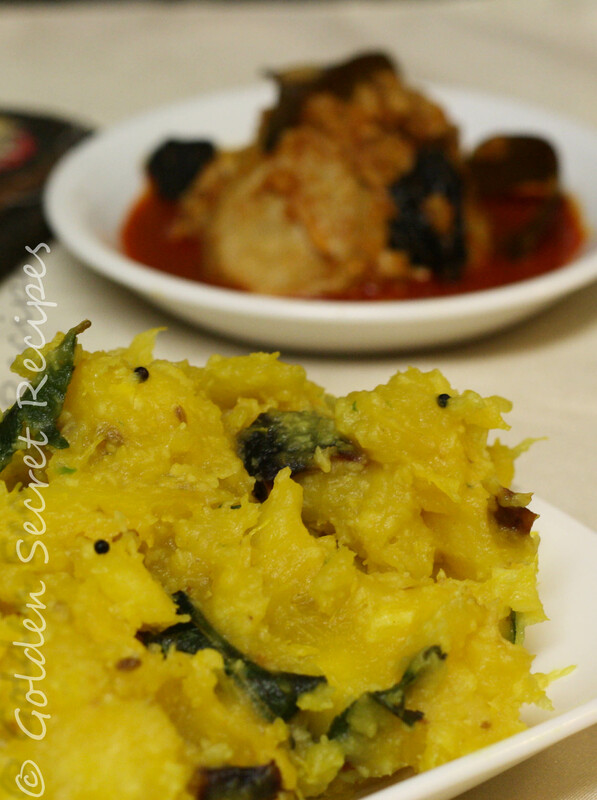 Serve with extra dry garlic chutney, chopped onion, roasted green chilli and a lime wedge on the side. 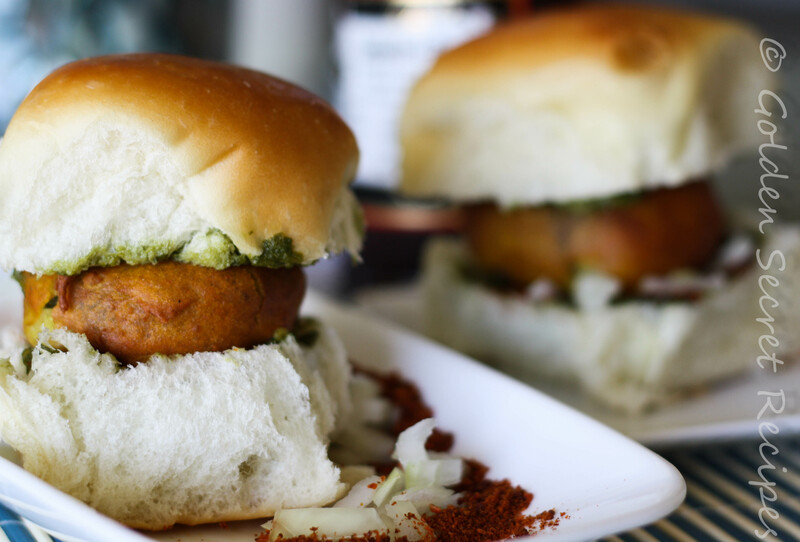 Enjoy this lip smacking vada pav with loved ones. NOTE: 1. I didn’t use baking soda for the batter. It still came out well. 2. Rice flour makes the vada crispy. 3. For deep frying, put the vadas into the oil only when the oil is heated well. If not, the vadas will drink a lot of oil. You can do a test to check if the oil is ready, by putting a drop of the batter to the oil. If the batter goes down into the oil and comes back up quickly and turns brown immediately, it means that the oil is heated well. 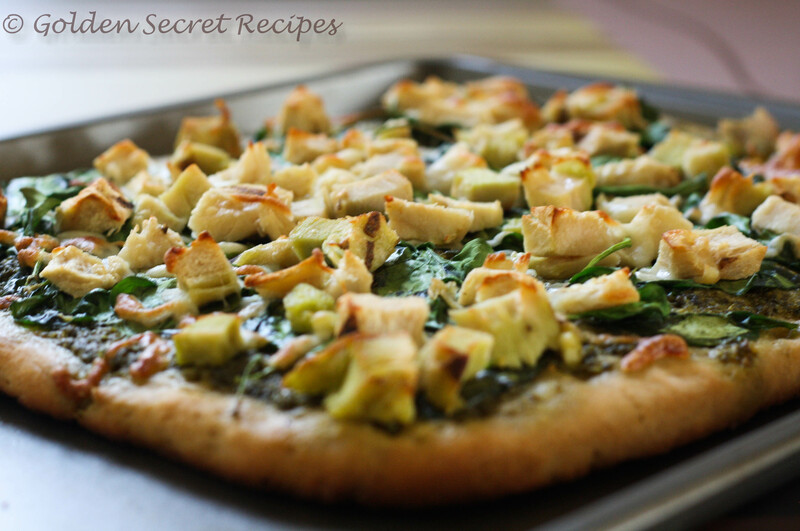 Having said that if you do not want the pain of making the pizza dough by yourself, you could just buy pizza dough from stores and make this yummy pesto chicken/paneer pizza. Pesto sauce works really well for pizzas. I have been a fan of pesto pizza from the day I first had this pizza @ work. 1. In warm water, add sugar and yeast. Close the lid and let stay for 15 mins until foamy. 2. In a stand mixer/food processor with dough blade, pulse the wheat flour, salt and olive oil well. To this add the foamy yeast mix and mix/blend well. 3. Add 2 tbsp water in case the dough is not binding well. Once done, knead by hand for 5 minutes. 4. You could skip Step 2 and 3 if you prefer to knead the dough using hands. Combine the flour mixture to form slightly firm dough(Similar to chappati dough). 5. Grease a bowl and cover the dough with a damp cloth and let it rise for 2-3 hours. After 2 hours, knead the dough for 5 mins again and let it rise for another hour. 6. Once the dough rises, knead the dough using hands for 2-3 mins. 7. Spread the dough by hand onto a baking sheet/tray greased with oil/cooking spray. Alternatively, you could use a rolling pin. When you spread the dough by hand, you could make it into any shape you want. I had made a square base. Tip: Once you have rolled out the dough, using a fork, tap the dough here and there. This will prevent any bubbles being formed while baking the pizza. Skip the steps to make the pizza dough(step 1-6) if you are using store bought pizza dough. Once you have spread the dough, its time for the toppings. 8. Spread pesto sauce on the base. 9. 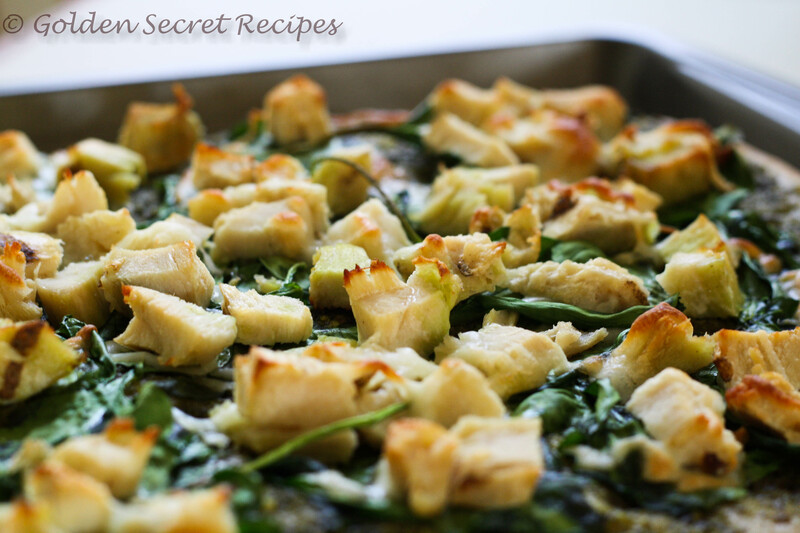 Evenly place the spinach leaves and put the chicken/paneer cubes on top. 10. Sprinkle the shredded cheese over the pizza. 11. Preheat the over to 400 degree F and bake for about 15-20 mins or until the crust is golden brown. So I decided to try making Shrimp Quesadilla. The day I decided to make this, I went all out in buying everything that would go well with it. The grocery list was huge 😛 (chips, soda, sour cream and everything required to make salsa, guacamole etc etc 🙂 ). DD pointed it out to me that buying a quesadilla from a restaurant would have worked out cheaper 😛 LOL! All I can say is that all the effort and money that went into making it was definitely worth it!! 1. Mince shrimp in a food processor/grinder. 2. Heat oil in a pan and put finely chopped garlic. When the garlic turns light brown, add chopped onion and salt. 3. Cook till onion turns light pink. To this add pepper powder and cumin powder. Saute for few seconds. 4. Add finely chopped bell peppers. Cook till the bell pepper is little soft. 5. Add minced shrimp and sauté till the shrimp cooks through. It wouldn’t take much long to cook. 6. To this add cream cheese and mix well. Saute for 3-4 mins. Garnish with chopped coriander/cilantro leaves. 7. To make the quesadilla, take tortilla and layer the tortilla with the filling. Spread the filling evenly. Top it with some cheese. 8. You could either spread the filling in half the tortilla and fold in the other half. Or alternatively, place filling in one tortilla and place another tortilla on top of the other and press it together. 9. 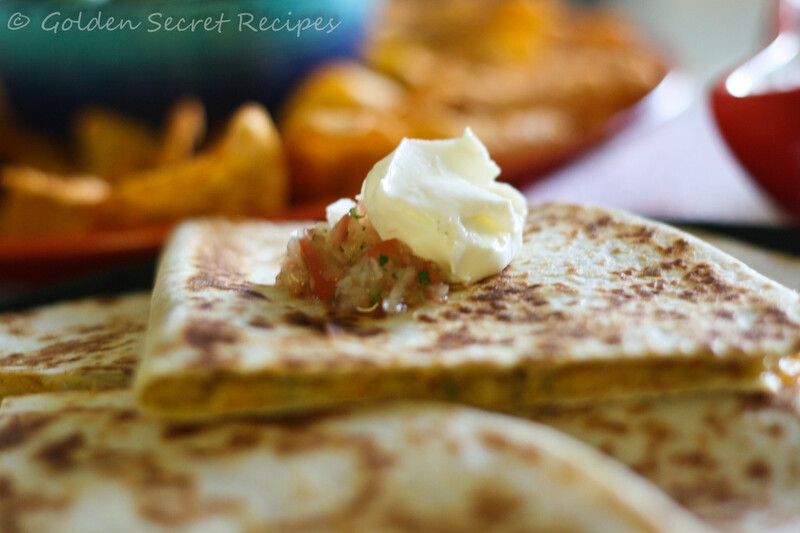 Once ready, heat a pan and toast the quesadilla till it becomes slightly crispy and brown on both sides. Alternatively, you could bake it in the oven at 375 deg F for 10 mins . 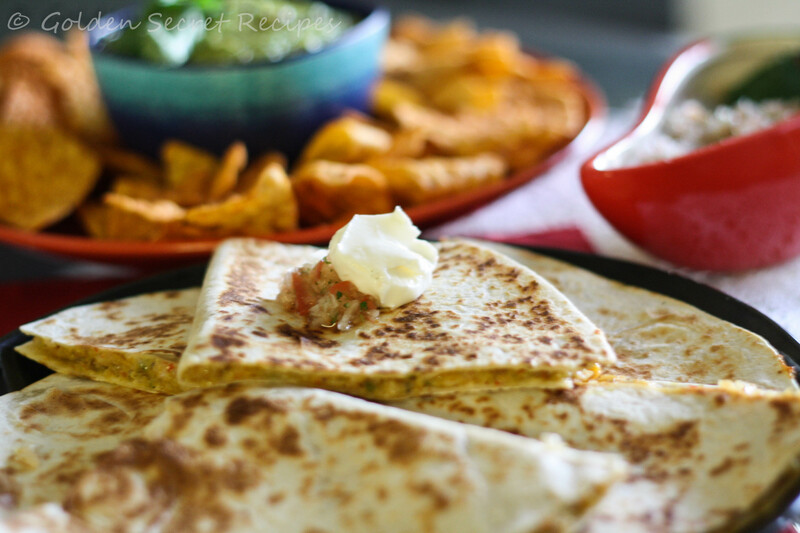 Serve warm Shrimp Quesadilla with sour cream, Guacamole and freshly made salsa. If you ever happen to ask any of the typical mallu, what is the most famous ‘Kerala Special’ delicacy they can think of, I bet 90% are going to tell – Kappa Vevichathu(Boiled and seasoned Tapioca/Yucca root) and Meen curry (Fish Curry) . Now everything else pretty much you would get in most other places. But I haven’t seen this combination or even any variation of this combination in any other cuisine. 1. Boil small cubes of tapioca with enough water(apprx. 1.5 cups), turmeric powder and salt. If using cooker, give about 4 whistles and keep in simmer for 2-3 mins. Once done, mash the tapioca roughly. 2. Grind the ingredients under ‘To grind’ section in a mixer to form a coarse paste. 3. Heat coconut oil in a pan and put mustard seeds. When it splutters, add dry red chilli and curry leaves. Once it splutters, add the mashed tapioca to the pan. 4. Add the ground mixture and mix well with tapioca. Saute for 4-5 mins and remove from heat.